Bad Axe has 24 locations across the country, including one on Grand Avenue in East Dallas. “It’s different," on customer said. "You can hang out here, and it’s a lot better than bowling or a movie." 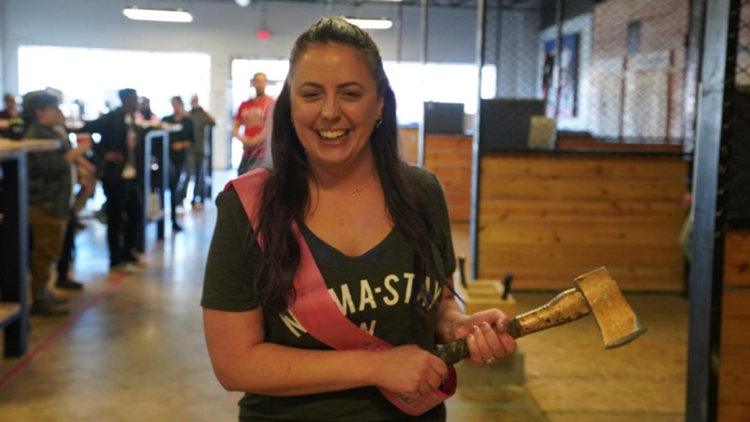 On a recent Sunday afternoon on Grand Avenue in Dallas, Lindsey Yeates and 20 of her friends were celebrating her 32nd birthday – by learning to throw axes. 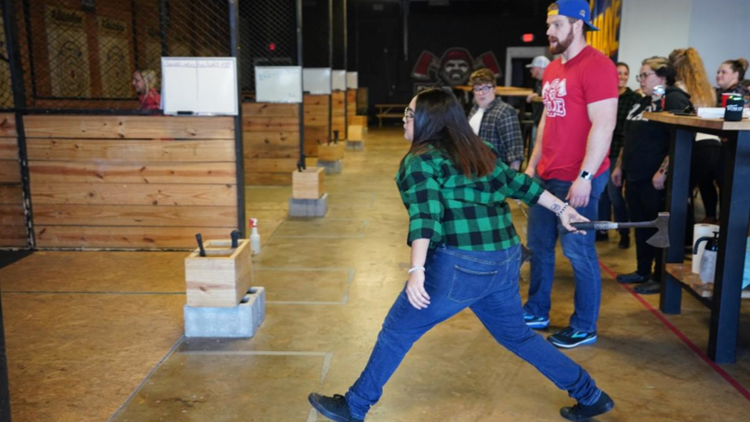 Whether axe throwing is a craze or not, Bad Axe Throwing, BAT, a firm with 24 locations around the country, is making a business of it, and Ms. Yeates and her crew, clad mostly in lumberjack plaids, were having a raucous time. The storefront was filled a constant "thwack-thwack" as axes hit the wall, usually clattering to the floor, with an occasional shriek as a hatchet stuck. Like most customers, they’d rented the whole place for two and a half hours, and brought the birthday cake. “It’s different. You can hang out here," Yeates said, "and it’s a lot better than bowling or a movie." Linsey Yeates and “Goldy,” a one-off hatchet that is a local favorite. For $35 each, the throwers get a coach, axes, and a half-dozen throwing lanes, each protected from wayward hatchets by a chain-link fence. Everyone was a first-time thrower, but most soon learned to plant the tool in the wood target about 20 feet downrange. He likes Goldy, a gold-painted axe in the inventory, but says thinner bladed hatchets like the Estwing brand may be better for throwing. Two-handed, over-handed, underhanded, double-handed – the variations are endless, although Kendall tries to keep it simple with first-timers. Safety, he said, is BAT’s primary concern. Spectators are required to stand well behind throwers. 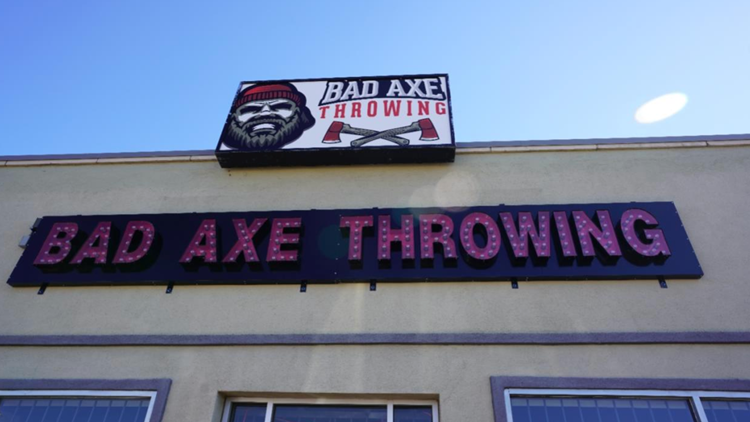 Although the Dallas location, the only Bad Axe Throwing in Texas, has only been open seven months, Kendall points out that there is a World Axe Throwing League. “We have rules and standards, and a world championship,” he said. Desiree Ronquillo lets one go underhanded as the coach watches. Last year, the world championship was on ESPN and attended by twenty-two League members, including Autobahn Axe Throwing of Baltimore, Tom O’Hawks of County Galway, Ireland, and the Rockaxe City Throwing Club of Huntsville, Ala. The 2017 winner hit the bullseye 75 percent of the time. That said, the after-party at the 2018 championship was sponsored by The Axe Throwing Insurance Company.